The Easter bunny has nothing on you. 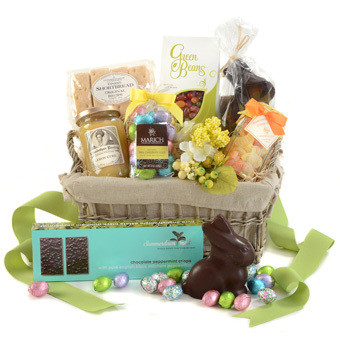 Overflowing with an impressive assortment of award-winning springtime treats, our lavish Easter gift is sure to delight come Easter morning. This beautiful gift begins with Summerdown Crisps, a luxuriously thin, crispy wafer made from rare, single-estate Black Mitcham peppermint in Hampshire, England. Handmade Scottish shortbread, a buttery delight, is perfectly paired with the bright, citrusy flavor of Elizabethan Pantry's intense lemon curd. A jar of old-fashioned citrus hard candies from L'Ami Provencal in France is reminiscent of a long-ago era, and make a stunning gift on their own. Chocolate lovers will appreciate a chocolate Easter bunny and festively wrapped milk chocolate eggs from Marich confectionary. And jelly bean aficionados will be happy find a box of all-natural green bean jelly beans, brilliantly hued and made from pure fruit juice concentrates. Your gift will arrive in our signature linen-lined hamper, adorned with spring ribbon and floral pick. Summerdown Mint - Chocolate Mint Crisps: Luxuriously thin, crispy wafers made from rare single-estate Black Mitcham Peppermint.....an ideal accompaniment to tea or coffee. box of 30 crisps, 7.05 oz. The Shortbread House of Edinburgh - Handmade Scottish Shortbread: A rich, buttery shortbread from a small family-run bakery. Winner of an unprecedented 12 Great Taste Awards. 8 shortbread fingers, 6 oz. Elizabethan Pantry - Lemon Curd: An intensely flavored citrus fruit butter, unparalleled for flavor and texture. An ideal pairing for pound cake, scones, shortbread, fresh fruit and ice cream. L'Ami Provencal - Old Fashion Citrus Hard Candy: Traditional French lemon and orange hard candies, reminiscent of days gone by. EMVI Chocolate - Milk or Dark Chocolate Easter Bunny: This charming semi-solid rabbit is handmade in upstate New York from premium chocolate. Marich Confectionery - Foil Wrapped Milk Chocolate Eggs: Premium, silky milk chocolate eggs wrapped in vibrant foils. approximately 30 eggs, 6 oz. Marich Confectionery - All natural "Green Bean" Jelly Beans: Made with fruit juice concentrates and colored with natural fruit and vegetable extracts for a pure, delicious treat! Small Antique Lidded Hamper with Linen Lining, 12" x 8" x 5.5"